A quick view of the most influential metrics in Searingtown. Searington is a CDP and unincorporated area in the town of North Hempstead in Nassua County, New York. It is considered part of the Greater Roslyn area. It is a thriving urban neighborhood and quite popular with urban sophisticates. Over 33% of adults in Searington have advanced degrees, which is over three times the national average. It is a semi-diverse community. English is the primary language followed by Spanish, Gujarati, Chinese and Korean. It is blessed with good schools, quiet streets and low crime rates making it extremely family friendly. The community spans .9 square miles of exclusively land area. It is a predominantly white-collar community and a wealthy one compared to both state and federal economic statistics. In 2000, the population was $5,034 and the population density was 5,473.4 people per square mile. In the same year, the median household income was $120,546, the median family income was $126,182 and the per capita income was $49,113. By 2015, the estimated median household income was $160,605 and the estimated per capita was $56,666. In the same year, the estimated median house or condo value was $772,272, the mean housing price on all units was $572,425 and the median gross rent was $2,240. For those that work outside the community, the average commute is a long one, approximately one hour in length. Commuting via personal vehicles is the most popular solution. However, public transportation is available and traveling by commuter trains is another popular option. Public education is primarily provided by the schools of the Herricks Union Free School District. Students attend classes at schools located in neighboring communities. One site of interest within Searingtown, is the Searington Methodist Church which was established in 1788. Parts of the original structure are still present in the structure today. The vacancy rate within the community is approximately 9%, meaning that there are a number of housing options to choose from. Housing primarily consists of traditional single family homes ranging from three to five or more bedrooms. Many of the residences were built between 1940 and 1969 and the remainder were primarily built from 1970 to present. Homes for sale come in a variety of sizes and styles to better suit the needs of buyers. Other real estate options include apartments, duplexes and other rental properties as well as the occasional townhouse condominiums for lease. Whether you need a bachelor pad, a starter home a sprawling family home or just a place to retire, Searington has what you need. To begin your home search in Searington, call friendly local real estate agent Ed McNulty at 516-887-3603. Call today, don't hesitate to find the home of your dreams. View our selection of available properties in the Searingtown area. 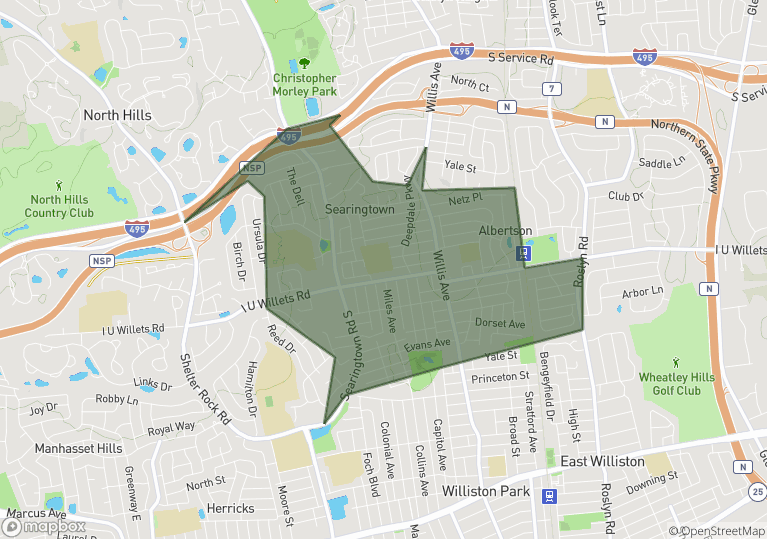 Check out the latest demographic information available for Searingtown. Learn more about schools near Searingtown complete with ratings and contact information. Browse through the top rated businesses in the most popular categories Searingtown has to offer.